D.O.T. direct OEM style replacement turn signals for Hondas, Kawasakis, Suzukis, Yamahas, and Harley-Davidsons. Over 400 different styles available with over 4000 applications. Also available with clear lens and amber colored bulb. Bright turn signal with 44 amber LED's, available in 2 wire chrome, black or carbon print body and clear lens. K&S # 25-7500 (top) and 25-7001C (bottom) series universal D.O.T. turn signals. Available in chrome, black or carbon print body styles and amber lens or clear lens with amber bulb. 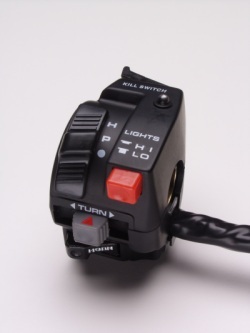 K&S offers a variety of universal motorcycle handlebar controls including D.O.T. models for dual-sport and street/cruiser models. K&S offers a variety of bulb types. Available in clear or amber. K&S offers the most complete gasket engine kits for popular ATV and MX models. K&S offers the most complete oil seal kits for popular ATV and MX models.